Charo? Was this recorded for one of her "Love Boat" appearances? Did she sing this at the ship cabaret? I think it probably was. I have a vague childhood memory of her singing it. Wasn't she a semi-regular for a while? Well, she was certainly on for what seemed like 4 times a season at some point. 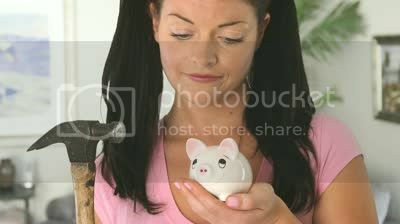 The piggy is looking up at you in a way that could be considered fearful, if it wasn't for the painted-on smile. Pledges in the next few minutes will win Feel It Break by Austra, coming up next. Hi there IX, thanks so much! Aw crap just got in and got a long meeting coming up. YECCH. yes 430 is the bewitching hour. 420 is the warmup. Pledge now for the Emily Danger CD! BRING IT, PEOPLE! IT COSTS MONEY ACTUALLY FOR JULIE TO DO THIS! If you pledge $75 or more, that'll be given away end of the show. IX I like your profile picture. Pledge pledge pledge!!! You know you want to!!!! break that piggy bank! Morning, Meghan! Thank you very much Julie it's an exclamation depiction of Dante Alighieri's 2nd canticle of the Divine Comedy-- turning always to the right! This canticle si the book of healing! Digging this 'Night time Watching' track quite a bit. probably cutest response to someone asking for a premium "at least somebody likes it. yay!" Man! I step out of the shower and hear- Meghan is a big Nick Cave fan and she's not allowed to go to Barcelona! Thanks for rubbing that in! Gesh! Meghan you should log in, we don't see your heart! good Morning Julie am laid up at home .. what's with the hearts ? the hearts are from people who have pledged! You get a little heart if you!v,e pledged, & it changes color when you click on a WFMU Friendship Society profile! I did! Ha! On my phone so that is why no heart yet..... But it is there! PLEDGE for the love of LUSH!!!!! and if you stand upside down, the heart'll look like a bum! what if I pay the full amount online will i still get a heart ? Yes, Jay, you'll get a heart! On Seven Second Delay today they actually OMFG waterboarded??????? Love the show thanks guys! @Ben there is no other WFMU in the world, nor any other similar rladio station you can find! Pledge to the only Julie in the world & the only WFMU! Morning Woj! You guys got snow on the ground? Ohhh, different Ben! Fooled me! Just a couple more minutes until the Julia Holter giveaway. get in the running! Hi Hamburger how goes it ? Oh crap I missed austra, milla, gall, milla, lush, cranes. I have lost my will to live. Well at least I'm at the right show. I should have a heart now!...... I hope! Meghan has a heart! FVH we have more Austra next week! Oh, and remember..... Julie has yet to be adopted! So if you pledge a mouse size pledge ($365), you can adopt Julie!!!! did i not adopt Julie with my mouse ? Be sure to ask all listeners of this show to write DNotS into their will. Cos ya never know eh. ah this verse singing reminds me of cold war kids "hang me up to dry"! also an abba / bee gee's song. not sure. A mouse would bring me so close to my goal tonight! you are so heartless FVH! I love when people make their goals........ it makes me so freaking happy! It's like good karma for everyone! FVH is a temporary Tin Man. Lovable, even if heartless. HEY! Stan got excited to see Bosco! Yay, Bosco is there! My adopted doggie! Is my heart still black? My heart was black during Seven-Second Delay. Felt so right! In late for a bit of the early morning goodiness of Dark Night. Stupid broken laptop of mine prevented me getting to hear live. AUSTRA! KATIE STELMANIS! And I was just listening to their brand new pre-release song! SWEET! Nice surprise indeed!!! I like Austra very much, so that's FANTASTIC! Cut your (strawberry) with a cake (switchblade)!